Charlotte studied studio ceramics at Falmouth College of Art, graduating in 2001. 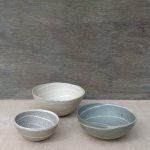 Since then she has exhibited widely throughout the UK developing a strong following for her delicate hand thrown pots. 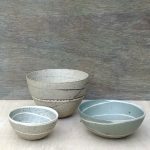 She settled in Cornwall after years of travelling and its dramatic land and seascapes inspire her ceramics. 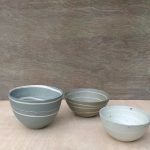 She has always been a prolific draughtswoman; her sketch books are full of pebbles and natural found objects which inspire her pots. 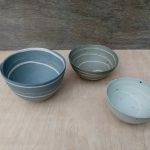 She uses stoneware clay from north coast St Agnes, adding oxides and other clays, which are dug from various Cornish locations, to make different batches of coloured clay. The pots are like a collage, so the colours and patterns go all the way through, rather than just the coated surface. Pot bases are thrown, coils are added, pinched and scraped into an organic vessel. Burnished with a pebble when leather hard, the pots are then high fired. Inspiration for her colours is found in the changing fields, hedgerows of gorse and hawthorn, wild flowers, sky and sea. 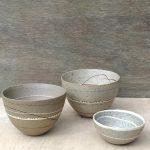 Patterns are abstracted from granite walls, field lines, cliff and rock strata and sea and surf lines of the Cornish coast which surrounds her.